In 2011 Rihanna was the face of Nivea and to celebrate the skincare brand’s 100th anniversary she took part in a short promotional tour around Europe. On each stop Rihanna performed her single California King Bed, which was used in Nivea’s commercials that year. Here’s a look at what she wore on two of the those stops. 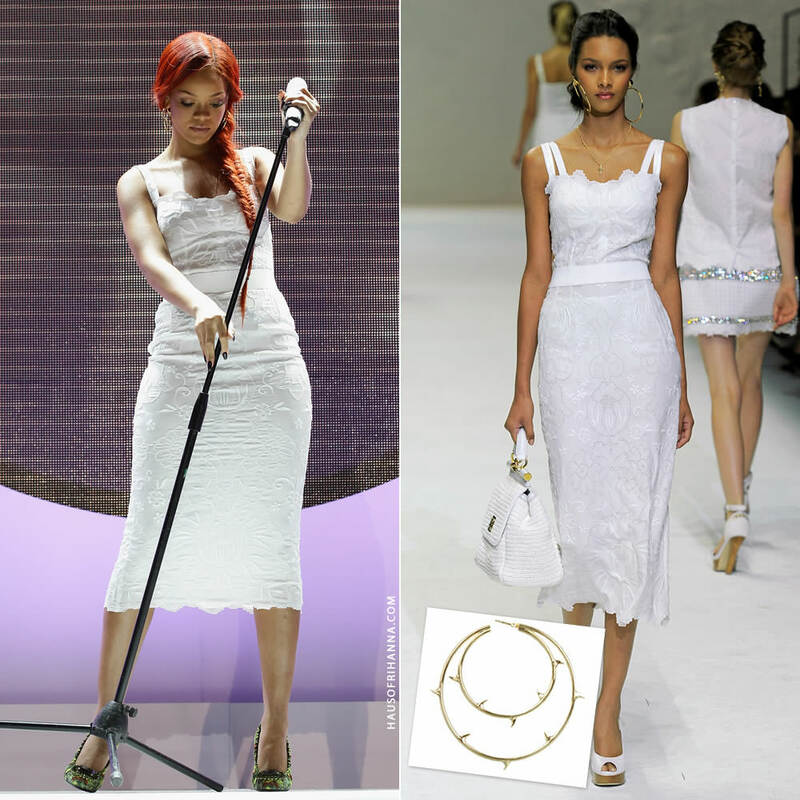 On May 5th, the singer made her first appearance for the Nivea 100 Years of Skincare event in Milan, Italy where she hit the stage in a white dress from Dolce & Gabbana‘s Spring/Summer 2011 collection. The mid-length dress boasted eyelet and embroidered detail, a cinched waist and thick straps. She rocked it with printed pumps and Agent Provocateur‘s yellow gold thorn hoop earrings. The next day the Barbadian star hit the red carpet in Paris. Here her red hair was styled in flowing waves instead of the fishtail braid from Milan and it added to her ethereal look for the evening. She wore BCBG Max Azria‘s Marley dress. The Marley is a tiered taffeta maxi dress with eyelet detail and a sweetheart neckline. Her jewellery included a Bjørg cuff bracelet. This is the brand’s rose gold-plated After Eden cuff that is shaped like a spine. You can purchase it from Avenue 32 for $935.